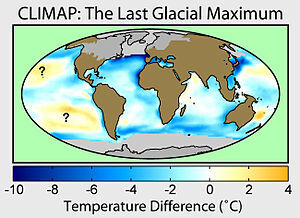 ^ The Last Glacial Maximum. Peter U. Clark, Arthur S. Dyke, Jeremy D. Shakun, Anders E. Carlson, Jorie Clark, Barbara Wohlfarth, Jerry X. Mitrovica, Steven W. Hostetler, A. Marshall McCabe. American Association for the Advancement of Science. 7 August 2009: Vol. 325. no. 5941, pp. 710 - 714. [2010-01-27]. doi:10.1126/science.1172873. ^ Mithen, Steven. After the Ice. Cambridge, Massachusetts: Harvard University Press. 2004: 3. ISBN 0674015703. ^ 6.0 6.1 Mangerud, Jan; Jakobsson, Martin; Alexanderson, Helena; Astakhov, Valery; Clarke, Garry K.C; Henriksen, Mona; Hjort, Christian; Krinner, Gerhard; Lunkka, Juha-Pekka; Möller, Per; Murray, Andrew; Nikolskaya, Olga; Saarnisto, Matti; Svendsen, John Inge. Ice-dammed lakes and rerouting of the drainage of northern Eurasia during the Last Glaciation (PDF). Quaternary Science Reviews. 2004, 23: 1313–32. Bibcode:2004QSRv...23.1313M. doi:10.1016/j.quascirev.2003.12.009. （原始内容 (PDF)存档于2012-07-13）. ^ Sathiamurthy, E.; Voris, H.K. Pleistocene Sea Level Maps for the Sunda Shelf. Chicago IL: The Field Museum. 2006. ^ Mauna Kea Hawai`i's Tallest Volcano. USGS. ^ Rabassa, Jorge; Coronato, Andrea; Bujalesky, Gustavo; Salemme, Mónica; Roig, Claudio; Meglioli, Andrés; Heusser, Calvin; Gordillo, Sandra; Roig, Fidel; Borromei, Ana; Quattrocchio, Mirta. Quaternary of Tierra del Fuego, Southernmost South America: an updated review. Quaternary International. June 2000, 68–71: 217–240. Bibcode:2000QuInt..68..217R. doi:10.1016/S1040-6182(00)00046-X.